Trolls gonna troll, no matter whether it’s in the comment section of a blog post or a VR environment. As more people begin to experience virtual reality through smartphones and high-end gear like the Oculus Rift, Google has begun developing some ways to dissuade people from messing with others in VR. The company’s Daydream Labs worries that some people – in their efforts to test the limits of the medium – will try to interfere with others’ virtual experiences. In an experiment featuring a simulated clothing store environment, some users blocked others’ view by placing hats in front of their faces. Unless they could successfully remove the hats without being able to see, those users were forced to reset their experience and start over. The team behind this has come up with an idea to prevent people from invading others’ personal space. 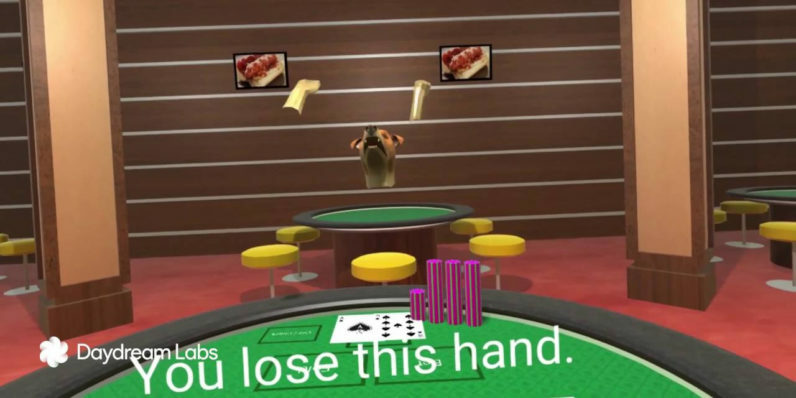 As shown in this demo, which features two dogs playing poker, leaving your seat to approach the other user (whether you intend to taunt or steal their chips) causes you to become invisible to everyone else in the experience. In addition, your view turns to black and white and a floating bubble guides you back to your seat. Another idea involves rewarding players with cute animations when they interact with positive actions like high-fives, while others like punching simply don’t trigger any response. It’s interesting to be able to see the foundation of an all-new medium take shape. Developers are only getting started with what’s possible in VR, and as we look to more immersive experiences, ideas like these will become essential to ensuring that everyone has a good time.